Sew Mama Sew and Spoonflower have been holding a Kitchen Linen Challenge all week and I am so excited to be participating. I had so much fun choosing my fabrics. It took quite a while because the options are endless on Spoonflower. 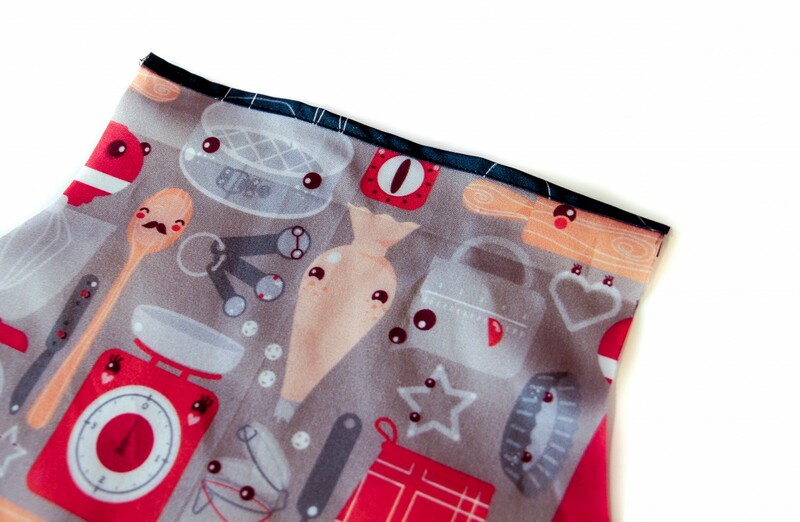 I will definitely be fabric shopping at Spoonflower again! Not only is the selection amazing but delivery to Canada is very reasonable and my order arrived quickly. 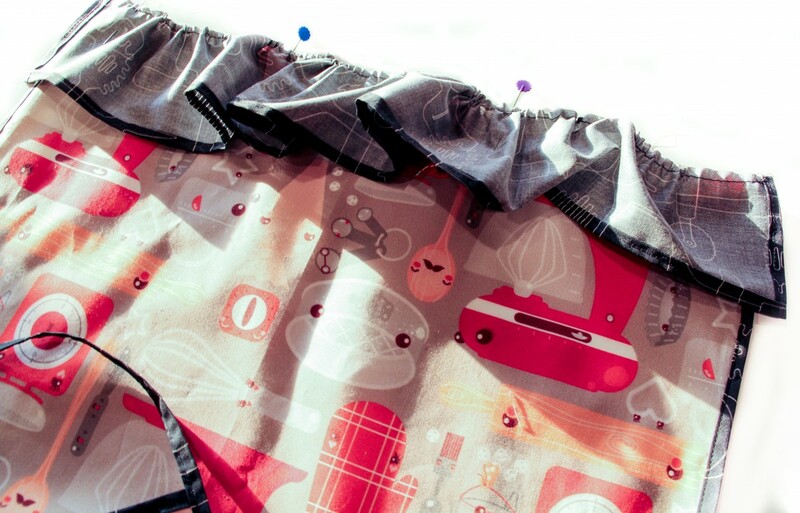 This little children’s apron is a quick little project. This one is sized for a 2 or 3 year old, but it would be easy to upsize it if needed. From your main fabric, fold in half and cut one piece 8 inches by 19 inches. On the non-fold side, mark 4 inches from the fold and 6 inches from the top. Connect the marks with a wide swoop. You could also draw a straight line connecting the two marks but I think this curve gives it a nicer finish. Trim your fabric on the line you just made. All of the following except the last piece will form the bias tape finish around the apron. With an iron set to the appropriate fabric setting, press these pieces to form bias tape (I like to press mine wrong sides together in half lengthwise, open up, and fold outside edges to the fold you just created, press each side and then fold again in half). Start by attaching the 8 inch section of bias tape to the top of the apron. I used a 1/4 inch stitch to secure. Then attach the 2 lengths that are 13 inches to the straight sides of the apron. The 2 pieces that are 40 inches form the bias tape for the curved part of the apron and the ties for around the neck and waist. Find the middle of the bias tape section and pin to the middle of the curve and out from each side. Start from one end of this section for the bias tape and stitch right from the start, along the curve and to the end of the piece. This will make the ties. To make the bottom frill of the apron, on three sides of the 3 x 35 inch piece, fold up a 1/4 inch and press, and then fold up a 1/4 inch again and press. Secure all three sides with a 1/4 inch stitch. On the edge not turned up, use a basting stitch and sew a 1/4 inch from the edge. Then use the threads on each side to gather the fabric till it fits the unfinished bottom edge of the apron. Pin to the bottom of the apron, right sides together. Sew with 5/8 inch seam. Press to open. I adore how cute this little apron is. Perfect for the aspiring baker! Be sure to visit the other participants in the Kitchen Linens Challenge and all their cool projects! 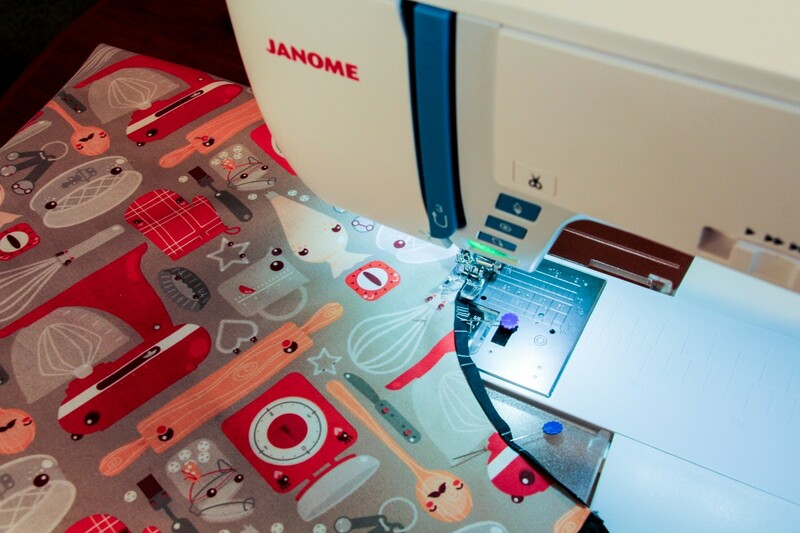 Pingback: Sew Mama Sew & Spoonflower Kitchen Linens Challenge: Stand Mixer Cover | Ants to Sugar – Quilter. Fabric Collector. Paper Piecer. 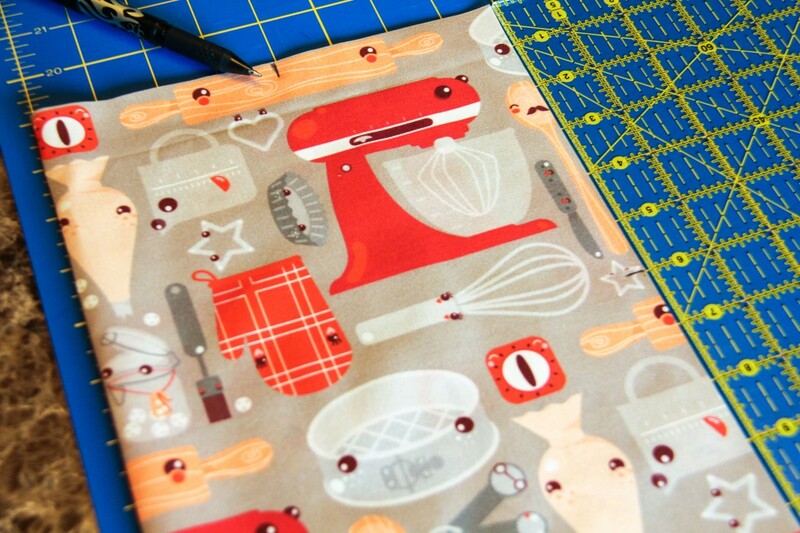 Pingback: Spoonflower Kitchen Challenge: Trina from Will Cook for Shoes | Sew Mama Sew | Outstanding sewing, quilting, and needlework tutorials since 2005.